Just like the Big Mouth but a little more...you know...little. 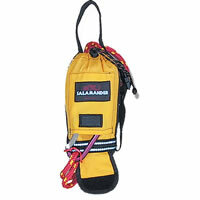 The Salamander Little Big Mouth 70 Throwbag features a tapered wide mouth design, permanent bucket style webbing handle, quick disconnect side handle to allow faster access without fouling the line and a carabiner pocket with carabiner offering the swimmer some quick clip-in capability. The Little Big Mouth comes stuffed with 70ft of 5/16" kernmantle 1000lb rope and has reflective fabric around the top and bottom to allow illumination in low light situations. A throwbag is a rescue device that has a length of rope that is stuffed loosely into a bag so it can pay out through the top when thrown to a swimmer. The bottom of the bag as a grab loop for the swimmer to hold on to. Throwbags are throwbags and should not be used for Z-drags or other high tension setups.